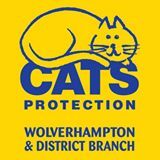 Wolverhampton Cats Protection is run entirely by volunteers who give up their free time to help cats. We work daily to rescue, rehabilitate and rehome stray and unwanted cats and kittens, as well as offering advice, information and education to the public on the welfare and proper care of cats and kittens. We are always looking for new volunteers and supporters to help us in our day to day work. If you are interested please call the helpline number. We need help with manning our telephone support line – this is something you can do from your own home. All our volunteers receive lots of help, support and training where required to ensure that both they and the charity get the maximum rewards from their time and efforts. Please note the Charity Shop is a retail outlet only. If you need help or advice regarding homing or welfare for your cat you must call our helpline on 01902 651173.